This month’s Sugar High Friday, which is being hosted by the knowledgeable and prolific Ruth of Once upon a Feast, has a ginger theme. For the event, I decided to make a ginger dessert by the distinguished pastry chef Claudia Fleming. On my recent trip to New York, I hoped to sample some of Claudia’s desserts. I knew she had left New York’s Gramercy Tavern and Amuse. I did research and found out that she and her husband, chef Gerry Hayden, were in the midst of opening North Fork Table and Inn on Long Island's East End. Because it was not yet open, I searched further and discovered that Fleming and Hayden had designed the menu for the IFC Waverly pub in NYC. 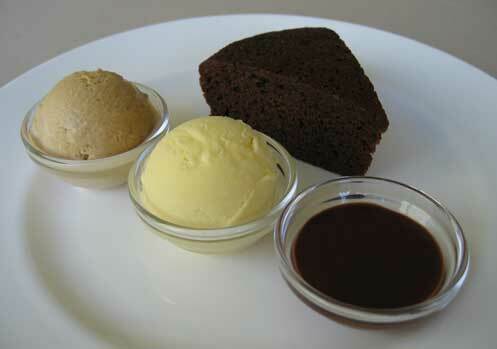 On the menu was Claudia’s Guinness stout ginger cake. So, I went to the IFC Waverly eagerly in search of her desserts, including the ginger cake. Yet, sadly, I was out of luck. The company that runs the IFC Waverly pub had cancelled her dessert menu, apparently because of cost and a lack of business. So, here I am making the Claudia Fleming dessert that I didn’t have a chance to try. My contribution to Sugar High Friday #19 is Claudia’s Guinness stout ginger cake served with her ginger and gingersnap ice creams and a chocolate ginger sauce. It is variations on the theme of ginger and a tribute to Claudia Fleming. The ginger cake has a rich, intense flavour. The ginger ice cream is a pure pleasure—people who admire ginger’s spiciness and kick will absolutely love it. The gingersnap ice cream is comfort food, reminiscent of ginger snap cookies and with more complexity than the ginger ice cream. Claudia’s recipes can be found in her sole cookbook, The Last Course. I very much hope that Claudia will put out another pastry book. 1. Pre heat the oven to 350ºF. Butter a 9 x 5 inch loaf pan, line the bottom and sides with parchment, and grease the parchment. Alternatively, butter and flour a 6-cup Bundt pan. 2. In a large saucepan over high heat, combine the stout and molasses and bring to a boil. Turn off the heat and add the baking soda. Allow to sit until the foam dissipates. 3. Meanwhile, in a bowl, whisk together the eggs and both sugars. Whisk in the oil. 4. In a separate bowl, whisk together the flour, ground ginger, baking powder, cinnamon, cloves, nutmeg, and cardamom. 5. Combine the stout mixture with the egg mixture, then whisk this liquid into the flour mixture, half at a time. Add the fresh ginger and stir to combine. 6. Pour the batter into the loaf pan and bake for 1 hour, or until the top springs back when gently pressed. Do not open the oven until the gingerbread is almost done or the center may fall slightly. Transfer to a wire rack to cool. 1. In a heavy saucepan, combine the milk, cream, and 1 cup of the sugar and bring to a simmer. 2. Meanwhile, whisk together the egg yolks and the remaining 1/4 cup of sugar. 3. Remove the milk mixture from the heat and add a little to the egg yolk mixture to warm it, whisking constantly to keep the yolks from curdling. Pour the egg yolk mixture into the hot milk mixture, whisking the milk constantly as you pour. 4. Return the custard to the stove and cook it over low heat, stirring constantly with a wooden spoon, until it thickens enough to coat the back of a spoon, about 5 minutes. 5. Remove from the heat and strain into a bowl. Stir in the crushed peppercorns and the salt. Chill the custard until it is thoroughly cold, at least 4 hours. 6. Strain again and freeze in an ice cream maker according to the manufacturer’s instructions. 1. Fill a medium saucepan with water and bring to a boil. Add the ginger and let it blanch for 1 minute. Using a slotted spoon, transfer the ginger to a heavy saucepan. Add the milk, cream, granulated sugar, cinnamon, pepper, nutmeg, and cardamom and bring the mixture to a simmer over medium heat. Turn off the heat and allow the spices to infuse for 20 minutes. 2. Meanwhile, whisk together the egg yolks, brown sugar, and molasses. 3. Return the milk mixture to the heat and bring to a boil. Turn off the heat and add a little of the hot milk to the egg yolk mixture to warm it, whisking constantly to keep the yolks from curdling. Pour the egg yolk mixture into the hot milk mixture, whisking the milk constantly as you pour. 4. Return the custard to the stove and cook it over low heat, stirring constantly with a wooden spoon, until it thickens enough to coat the back of a spoon, about 5 minutes. Remove from the heat, stir in the salt and strain the custard through a fine sieve, Chill until thoroughly cold, at least 4 hours. 5. Freeze in an ice cream maker according to the manufacturer’s instructions. Posted by Sam at 10:00 a.m.
OK - probably not a good blog site to visit when you are on a diet. ;-) - Thanks for the info - diet starts next week now. love love love your blog!!! it's truly mouthwatering. I am in so much trouble now- the BF loves Guinness... I have a sneaking suspicion I'll be trying this very soon (like probably this weekend). It looks divine, thanks for the post! The rich bodied Guinness flavour does enhance the taste, but the cake doesn't taste like Guinness beer. As you can see I have reposted to include the gingersnap ice cream. I hope you enjoy it! Three loves, wow! Thanks for visiting. Thanks for you comment Raspberry. I hope you and the BF enjoy the cake, it is moist, flavourful and intense. Too bad you didn't get to taste Claudia's dessert first hand, but I'm sure yours is amazing 0 it certainly looks that way. Thanks for participating in SHF - look for the roundup on Monday. I've always wanted to try the recipe for Guinness stout cake from "In the Sweet Kitchen" ... but I don't think it has any ginger in it. Mmm ... now I have two kinds of Guinness stout cake to experiment with! Ooh! I love how every piece of this (and, mmm, so many pieces there are) features ginger in a different way. Also, I hunger for it. Nice work! Nice Claudia Fleming trio you have there;) I haven't made any of those before so it's nice to know they turned out well. I wish she would write another dessert cookbook too! Thanks for your lovely comments and thanks for hosting Sugar High Friday this month. I for one love ginger. It is a lovely ginger cake. I recommend giving it a try. It's flavourful and intense, more for an adult's palate than for a child's. Thanks for visiting! I hunger for it too! I love that we both made trios by Claudia Fleming this week! She's just fabulous. We love you Claudia! Yum this all looks so fantastic! Wonderful entry for SHF. I too would love to sample one of Claudia Fleming's desserts (ok maybe more than one) in person. Here's hoping! wow...that's all I can say! This is on my priority list of desserts to make...thanks for sharing it! Ivonne, I hope you get to sample Claudia's desserts one day as well. Elizabeth, I hope you do make the cake Elizabeth. It is a nice full bodied cake. BUILD YOUR LIST, WIN THE WEEKLY DRAW, EARN MONEY! Learn more about it here: business opportunities site. It pretty much covers business opportunities related stuff and it is FREE to join.